On Sunday, May 22, 2016, Honeywell hosted New Jersey’s first Safe Kids Day 5K Run/Walk, with proceeds benefiting Safe Kids and children and their families throughout New Jersey. Runners, walkers, family and friends enjoyed a day of fun and games filled with interactive activities designed to raise awareness about childhood injury prevention. We thank Honeywell for their AMAZING support! 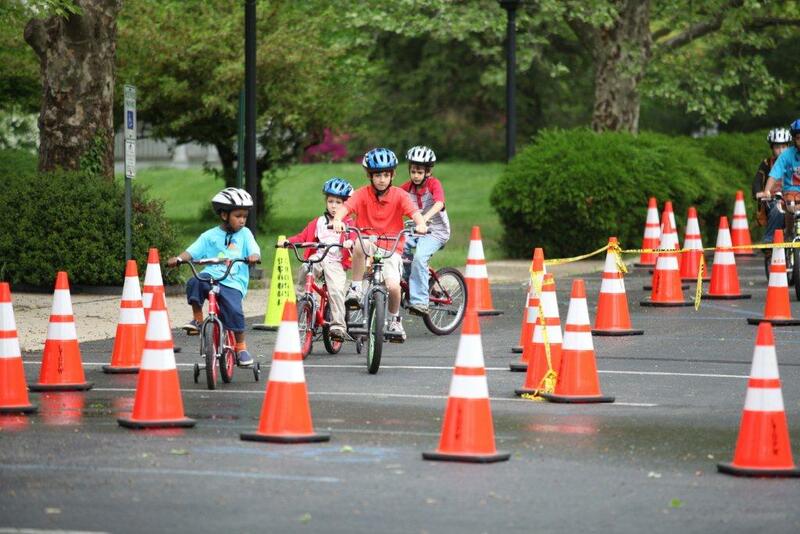 Safe Kids Mercer County will host its annual Bicycle Safety Rodeo and Safe Kids Day on Saturday, May 10 , 2014 from 9:00 a.m. until 1:00 p.m. The purpose of the event is to provide children ages 3-12 and their families with an opportunity to learn about safety and prevention while participating in sports and other recreational activities. The day will include bicycle inspections will be conducted by the Economy Bike Shop and the Lawrenceville Police Department. Bicycle tires, frames, handlebars, chain guards, and reflectors are checked, and parents receive a check-list for each bike indicating if anything needs to be repaired. Children are then given a free bike helmet, which is fitted by one of the St. Lawrence Rehabilitation Center’s therapists. They may ride a bicycle safety course, which is organized by the police department, where they illustrate knowledge of traffic signals, hand signals, parked cars, and how to avoid unexpected obstacles. Volunteers are present at each station of the obstacle course to guide and teach the children. Water safety programs will be conducted by the Hamilton YMCA and will include games and other activities geared towards water safety. St. Lawrence Rehabilitation Center will give away a limited number of Personal Flotation Devices for children up to 90 pounds. The Lawrenceville Fire Department will provide an engine, and teach children about fire hazards. Other participants include Capital Health, Robert Wood Johnson University Hospital at Hamilton, St. Francis Medical Center, the Princeton, HealthCare System, and the Trenton Thunder Baseball team, with mascot Boomer. Bristol-Myers Squibb will present an exhibit on hazardous materials. The Greater Mercer TMA, Lawrence Hopewell Trail, Lakeview Child Center, Inc., Making Waves Swim School, the Mercer County Sheriff’s Department, PNC Bank, RAI, McCaffrey’s Supermarkets, Quakerbridge Radiology Associates, the Hopewell and Lawrence Township Health Departments, and the Sports Concussion Center of New Jersey will also participate. Children must pre-register for this event to receive a free bike helmet and bike inspection. Registration will begin March 1, 2014 by email at bikerodeo@slrc.org (preferred) or by phone at (609) 896-9500, ext. 2212. Morristown Center and Goryeb Children’s Hospital Host Local Children and Families During Safe Kids Day to Celebrate Kids, Prevent Injuries and Save Lives. 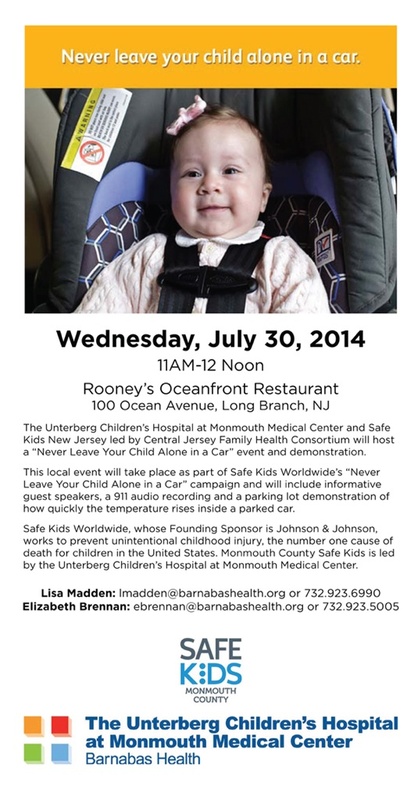 Morristown Community Rallies to Stop Preventable Injuries, the #1 Killer of Kids in the U.S. Safe Kids Northern NJ will host more than 100 families, community members and corporate partners, in honor of Safe Kids Day to raise awareness and resources to protect kids from preventable injuries and deaths due to motor vehicle crashes, fires, drowning, falls, suffocation and more. 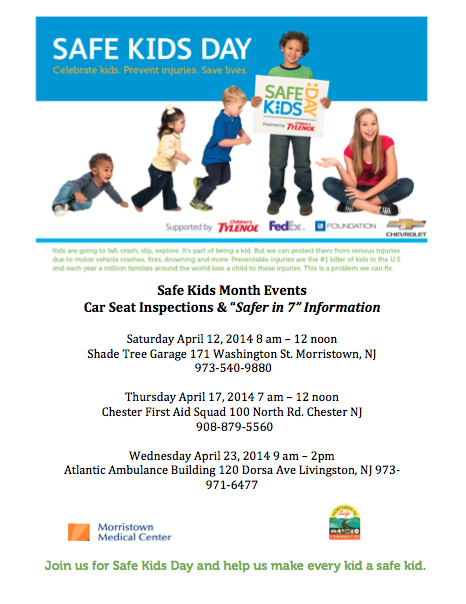 There will be two events in April that will conduct car seat inspections and provide more information about “Safer in 7.” One event will be held on Thursday April 17th, 2014 from 7 am till 12 pm at Chester First Aid Squad, 100 North Rd., Chester, NJ. Another event will be held on Wednesday April 23rd, 2014 from 9 am to 2 pm at the Atlantic Ambulance Building, 120 Dorsa Ave, Livingston, NJ. Did You Know? Every year, 9,000 families in the U.S. and a million families around the world lose a child because of a preventable injury. Millions more children are injured in ways that can affect them for a lifetime. Morristown is part of a larger celebration throughout the month of April that includes more than 100 communities across the United States. “Safe Kids Day has one simple, but critical goal: working together as a community to raise awareness about preventable injuries so kids can grow up to do all the great things kids were meant to do,” says KJ Feury RN, APNc, coalition coordinator. “This is a day to celebrate kids and make learning about preventable injuries fun. There will be great information for parents and caregivers on how to keep their kids active, healthy and safe, recognition of our Hats off for Helmet Award Winners and the unveiling of the new fresh Safe Kids Van. Safe Kids Day is presented by Children’s Tylenol with support from the General Motors Foundation, FedEx and Chevrolet. Half of the 2.4 million calls to Poison Help Number in 2010 involved children ages 5 and under. In fact, 9 out of 10 poisonings occur at home. 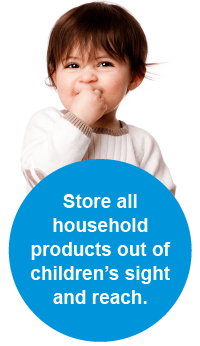 •Store all household products out of children’s sight and reach. Young kids are often eye-level with items under the kitchen and bathroom sinks. So any bleach, detergents, dishwasher liquid or cleaning solutions that are kept there should find a new storage location. •Store poisonous items out of reach or use safety locks on cabinets within reach. These items also include detergent pods for the laundry and dishwasher. It only takes a few minutes, and it gives you one less thing to worry about. •Read product labels to find out what can be hazardous to kids. Dangerous household items include makeup, personal care products, plants, pesticides, lead, art supplies, alcohol and carbon monoxide. •Make sure that all medications, including vitamins and adult medicines, are stored out of reach and out of sight or children. •Put the toll-free number Poison Help Number (1-800-222-1222) into your home and cell phones. You should also post it near your phone or on your refrigerator for the babysitter. Hopefully you’ll never need it, but it’s nice to have just in case. •Check for lead-based paint. Remove any peeling paint or chewable surfaces painted with lead-based paint. Every 45 minutes in the United States, a child is rushed to the emergency room for injuries caused by televisions that are not appropriately secured. 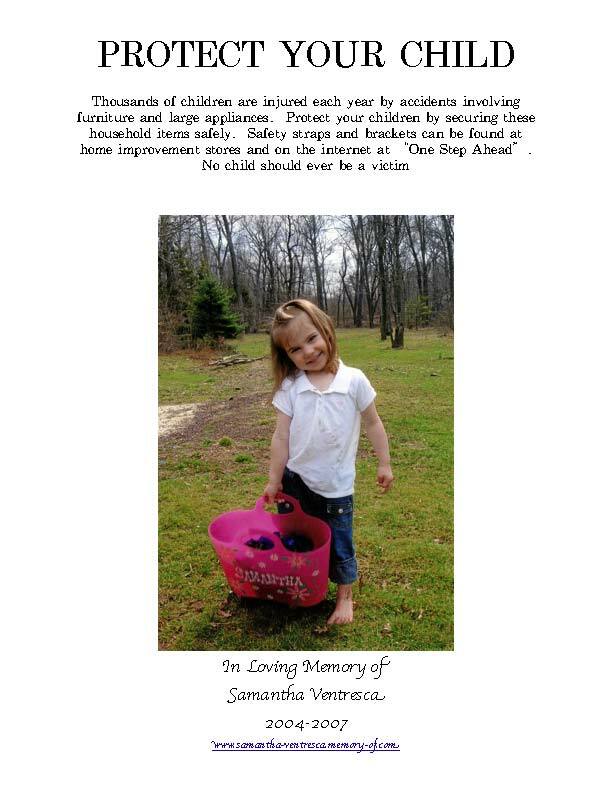 To help prevent these TV tip-overs, Safe Kids New Jersey is launching National TV Safety Day on February 1, 2014, the day before Super Bowl XLVIII. As families prepare for this must see event, National TV Safety Day raises awareness about TV tip-overs and educates parents and caregivers on the simple things they can do to make their homes safer. Many TV tip-overs are a result of televisions not being properly secured or placed in an unsafe location. From 2008-2012, twelve children in New Jersey under the age of five were killed and 33 children were hospitalized due to TV/Furniture tip overs. Nearly 2,000 children under age five visited the ER each year during this period due to tip-overs. Safe Kids encourages families to include TV safety as part of their childproofing plans by placing CRT TVs on low, stable and secured pieces of furniture. If families no longer use their CRT TV, consider recycling it. For families with flat panel televisions, Safe Kids recommends mounting TVs to the wall to reduce the risk of TV tip-overs. Secure your TV. If you have an older CRT TV, make sure you place it on a low, stable and secured piece of furniture that is appropriate for the TV’s size and weight. Recycle your TV. To find a location to safely and easily recycle unwanted TVs, go to http://www.GreenerGadgets.org. If you’re replacing your CRT TV with a new TV, be sure it’s properly secured.